Notes: You are a small start-up business focusing on the creative and artistic vision of space travel. Funded by international soccer star Hannah and bestselling author Zach, CEO Brandon has put together a team focused on not only achieving greatness, but bringing the public along for the ride through Zach’s engaging and dramatic narrative style as mission reports are expected to be compiled into a dramatic short story / serial narrative which will provide a significant boost to the start-up’s income and funding levels. Further, due to Zlotnick’s pre-existing endorsement deal with Kerbinite Fuel Systems, all liquid fuel is available to Brazanah Inc. at half price. Design Goals: Our Vehicle is designed to put a Kerbal above 50 km in the atmosphere and bring him back safely. We attempted to use cheaper but reliable parts to achieve this goal in order to increase our funding. We used one large fuel tank and a strong engine to provide enough initial thrust to reach 50 km, and fins and an ASA to stabilize the rocket to make it secure. The cockpit has a parachute attached to soften the landing. Launch Goal: We are hoping to gain a basic understanding of what makes a successful rocket that can travel far into the atmosphere. We expect to achieve the milestone of launching a Kerbal 50km into space. Pilot Plan: The pilot must first engage and manage the rockets. Once he reaches the apex of the flight he must disengage the cockpit and finally once the cockpit has fallen back a fair distance he will engage the parachute to return safely to Kerbin. Safety Rep: We will submit this flight plan to Brendan. For their first launch Kalizah and Brazanah are teaming up to try and reach 50 km. Team Members Present: Zach, Brandon and Kaila. The Hopeful 1 is ready for launch and I find myself nervously waiting here in the cockpit. Mission control is jabbering into my earpiece but I am too stressed to listen. I know what I must do, I have waited my whole life for this opportunity. I have engaged the SAS technology to keep the rocket from shaking out of control as we climb into the atmosphere. T minus 3, 2, 1 and I am deploying the thrusters. The force is incredible, I feel like I will be pressed through my seat! But no, I am climbing faster and faster, the roar of the engines is deafening. Thousands of meters are passing in what seems to be the blink of an eye and still I accelerate! I have to keep full attention on the throttle, pushing the engines as far as I can without overheating. The fuel is almost gone…and now the tank is empty, I must now disengage the cockpit. The engine and fuel tank have fallen off, everything is performing as the simulations indicated. I am trying to activate the parachutes on the engine to salvage it but they are not responding. Radio communications are now out of range, I cannot warn ground control of the falling debris. I must now refocus on using the thrusters attached to the cockpit to prevent a tailspin. I cannot believe the splendor of the cosmos, so many stars that seem so close I almost believe I can reach out and touch them. My time alone in space is drawing to a close, I feel the G force again as I begin to fall back to Kerbal. We are plummeting through the skies and I can feel the metal of the cockpit heating up, I am sweating as I wait for the parachute, which deployed at 20,00 meters, to open. This is the vital step, without this I will smash into beloved Kerbin. Success! After 15 of the most rapturous minutes of my life the parachute opened and I am coasting back to ground at a very safe 8 meters per second. Captain’s Report: This mission was a grand success that will bring much pride and glory to Kerbin. We far surpassed the expectations of mission control, achieving a height of 400,000 meters or 400 km, shattering the cautious parameters set by those scientists at mission control. 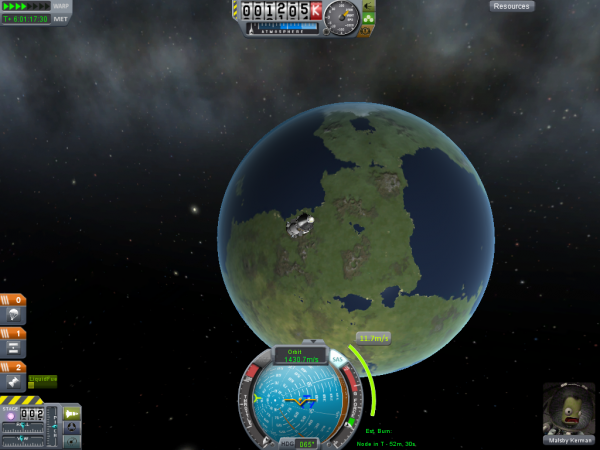 We rose to the occasion and reached 50 km with a man on board, myself the faithful pilot and captain Bob Kerman. I did experience turbulence on the way up, which was quite concerning, however the SAS and winglets performed admirably. In the future more stabilizing technology would be a kindness to any future pilots. Opportunities / Learnings: The value of a powerful engine, sufficient fuel and most of all parachutes were emphasized by this first launch and the successful return of Bob Kerman from the beginning of the atmosphere. It is vital to think about what we are seeking to accomplish, we had far more fuel and power than was necessary for the milestone we were attempting. Strategies / Project Timeline: In the future we will make an effort to not overuse large fuel tanks and strong engines, as we could have accomplished this goal with even cheaper components. Due to our high altitude reached we feel ready to attempt orbit following some more research and preparation. We need to find out what priorities to stress when considering orbit rather than a vertical launch. Milestone Awards Presented: $30,000 dollars to be split between the two participating teams. Available Funds: Each team has $22,427 remaining after splitting the cost of the rocket. Excellent job! Total milestone award is $30K as the first team to reach 50km, and Charlie's team gets $5K for a successful safety rep approval. Teams are also awarded a bonus $10K for the excellent narrative. Brazanah and Kailizah each get $15,000 of the reward bringing each teams funds up to $37,426. "Captain's Log": Makes me think your Kerbal is voiced by William Shatner. Design Goals: This rocket will put a Kerbal on Mun through multi stage deployment of various engines thrusters and parachutes. First we will use many powerful engines and lots of fuel to escape the atmosphere. We have winglets and SAS to maintain stability and safety during this stage. Once we have escaped the atmosphere and run out of fuel, we will separate from the initial engines, which will safely fall back to Kerbin with parachutes, and use the middle engine to achieve orbit and then put us on intersect course with Mun. This will then disengage and fall back thanks to parachutes. Once we land on Mun and complete activity there, we will use the final engine to orbit Mun then return to Kerbin. Launch Goal: We are hoping to learn how to successfully land on a foreign planet or moon and return safely by placing a Kerbal on Mun. That will help us to achieve the milestone of landing on Mun. Pilot Plan: The pilot begins with full ignition of the primary engines. Then he separates from those and uses the middle engine to achieve orbit, then set course for Mun. Once on Mun, he will return to orbit with the final engine and then return to Kerbin. Safety Rep: This plan is being presented to safety representative Charlie. Excellent start... some things to think about before launch -- how much fuel are you carrying, and how much will you need to get to the Mun and back? How will you land on the Mun? What design considerations do you need to take into account? How can you make things easier for the pilot (i.e. is it easier to land in light or darkness?) How will you put your craft onto an intercept path for the Mun, and how will you make sure you don't crash into it? Very, very exciting. Looking forward to seeing how it goes!!! Hmm, This looks a lot like one of Scott Manley's tutorial videos. I'll be watching you brazanah Inc. It is nearly 10:00 and the flight crew is giving us the all clear. All fuel tanks have been filled and all engines have passed inspection. Kerman has reached 7000 meters above Kerbin and is taking manual control of the flight to establish a 45 degree angle and enter orbit. After several minutes of radio silence we have reconnected with captain Kerman. He made an error in failing to separate from the middle engines and thought he had no more fuel! He has now removed himself from a position to shoot for Mun. Command has recommended Kerman abort his mission and return to base, having accomplished a lesser goal of putting a manned satellite in orbit. He is now using the final rocket intended to head to Mun and back to re-enter the atmosphere. Disaster has struck, Kerman separated from his final engine prematurely and now may not be able to escape orbit! Kerman did manage to break 70,000 m and is falling back to Kerbin now. Successful deployment of his parachute has returned Bob Kerman to base, not victorious but alive. All parts were salvaged and we are in excellent financial shape to make another joint Brazanah and Harbres venture towards Mun soon. Mission Report: This venture to place a Kerbal on Mun was not successful in its original goal of placing a Kerbal on Mun, but it did manage to put a manned satellite in orbit and return it home again. Our rocket is capable of sending a Kerbal to Mun, but some air headed piloting (Matt!) while we were orbiting Kerbin cost us our chance to make it to Mun. Instead we had to settle for a manned satellite which we returned back to land safely. In order to move on and reach Mun we must include some extra fuel so that the mission need not be aborted following one small error, as a safety precaution that ensures we will always have fuel to return to Kerbin. Opportunities / Learnings: This launch was not a total waste it taught us that few things ever go completely as planned or smoothly, and that we need to incorporate room for error into our rocket designs and flight plans. We will adjust our plans and attempt a Mun landing tomorrow. Strategies / Project Timeline: We cannot move on and turn our focus on Minmus as we planned, we must recalibrate and re-evaluate our plans to reach Mun first. We do not need to start over, merely modify our existing designs to make a Mun landing more feasible. We need to research how best to reach Mun from orbit for our next attempt. Milestone Awards Presented: We were second to put a manned satellite in orbit, for $25,000. Available Funds: Each team spent $11,278 on the rocket, and each team makes $12,500 in prize money. This leaves Brazanah with $43,648 and Harbres with $134,440. Next You might want to send up a one piece space station and attempt a docking. That way you can do a apollo 11 style moon landing. I would suggest looking at blueprints and designs. But great job! Also before you do a manned mission do a probe scouting mission. You might beable to find a good place to land. Greatjob! Well done and well written. I appreciate that you made an in-mission choice to abort the moon landing and return your Kerbonaut safely to his home. 1234 has some great advice about taking smaller steps to launch a space station and attempt a docking. Mastering this technique could be quite useful to your team in the long run! Bonus $10K to Brazanah for another best-selling post-mission report. Docking can be one of the more difficult maneuvers to learn when it comes to judging when the correct time to burn engines to rendezvous with target, but if you can successful it can be an efficient way of landing and knowing you still have fuel left in your drive stage to return you home. I would similarly recommend training yourself by attempting to build a small (key word there. Small) space station. Welp, Nice job on the manned satellite and yeah, Docking is really hard. I've had a ton of failed satellites to the mun. I would suggest having a unamnned mission to the mun first. And remember, Safety first! Maybe you could try and take a three or two man capsule into space and have a mini space station with solar panels and science equipment. This is because we recovered the parts from To The Mun when we failed and did a manned satellite instead, so all of the parts aside from our modifications were half off. Design Goals: This rocket will put a Kerbal on Minmus through multi stage deployment of various engines thrusters and parachutes. First we will use many powerful engines and lots of fuel to escape the atmosphere. We have winglets and SAS to maintain stability and safety during this stage, as well as solid fuel boosters and stabilizers for a more successful takeoff. Once we have escaped the atmosphere and run out of fuel, we will separate from the initial engines, which will safely fall back to Kerbin with parachutes, and use the middle engine to achieve orbit and then put us on intersect course with Mun. This will then disengage and fall back thanks to parachutes. Once we land on Minmus and complete activity there, we will use the final engine to orbit Minmus then return to Kerbin. Launch Goal: We are hoping to learn how to successfully land on a foreign planet or moon and return safely by placing a Kerbal on Minmus. That will help us to achieve the milestone of landing on Minmus and set us up for landing on Mun. Pilot Plan: The pilot begins with full ignition of the primary engines. First he separates from the solid boosters.Then he separates from those and uses the middle engine to achieve orbit, then set course for Minmus. Once on Minmus, he will return to orbit with the final engine and then return to Kerbin. I approve your plan for launch! Good luck! Bring your kerbal home safely! Malsby Kerman’s Flight Recordings, compiled each night after that days events. Day 0: Tomorrow I will pilot the improved design of Kerbin’s finest ship, To The Mun, in an effort to reach Minmus. Tomorrow I simply must pilot us into orbit, by using the first engines to break the atmosphere. I will then disengage those and use some of the middle engine to establish orbit. Day 1: Today was exhilarating, I am now orbiting Kerbin following a smooth ascent to orbit. The ship shook and rattled but the SAS did its job and we steadily escaped its influence. I cannot believe how small Kerbin seems when seen from above. Day 2: That was perhaps the scariest moment of my life, I willingly escaped orbit and sent myself into space. I am on course to encounter Minmus tomorrow. The middle engine was spent getting us into orbit, but the final engine is nearly full and all projections say we have more than enough fuel. Day 3: We encountered Minmus’ gravity and with a careful burn I have established orbit. I miss being able to radio Kerbin and talk to someone else, but this chance was more than worth it. Minmus is remarkable, its mountains are massive and I need to avoid them at all costs. Day 4: Today I walked on Minmus. I have the honor of being the first Kerbin to set foot on another planet, I will go down in history. Following a brief EVA I returned to ship. 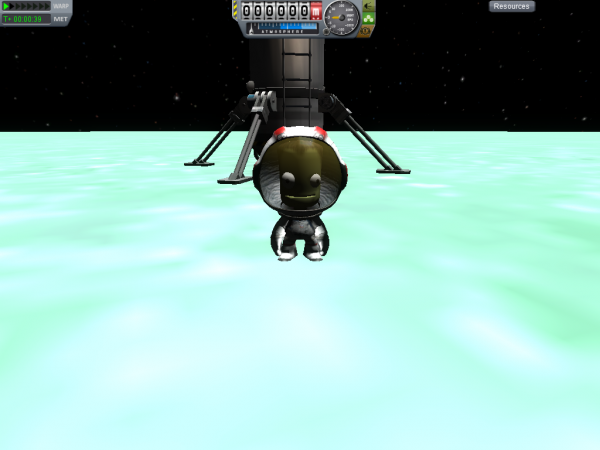 I used about a third of the fuel to send myself towards Minmus then slow down o a safe landing speed. The gravity is even weaker than we anticipated, I used very little fuel. 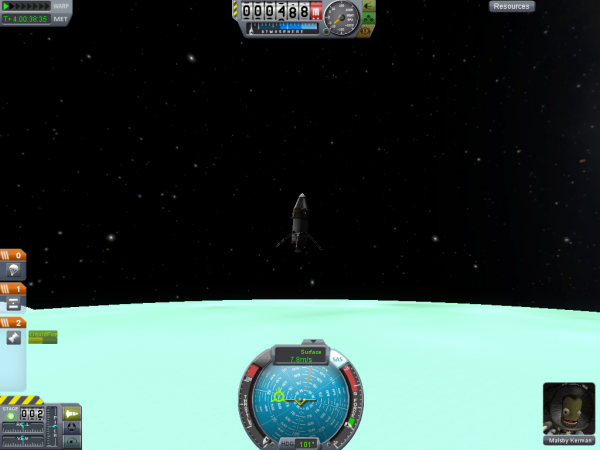 I have reentered orbit around Minmus and still have half a tank left. Day 5: No news today, I simply traveled closer to home and made one burn to alter our course. Day 6: After a very long two days of travel and three burns to adjust my trajectory, I will re-enter Kerbin’s atmosphere at 30,000 meters tomorrow. I’m almost home! Day 7: It is still early in the morning, and I have touched down on Kerbin thanks to a successful parachute deployment and using the last of my fuel to reduce my horizontal speed. Mission control were eager to see the pictures of Minmus I captured, and I have included them below. Summary: This mission was a resounding success. We succeeded in sending a Kerbal to Minmus and returning him, and there was never a moment of danger or a chance for failure. Our precautions of adding extra fuel paid off, we had a quarter of a tank in our final engine left when we re-entered the atmosphere. Opportunities / Learnings: We learned the value of careful planning and thinking before launch. We knew when we had to do all the steps that brought us to Minmus and back, and had a knowledge of the controls that made it easier to execute our strategy. Strategies / Project Timeline: We are ready to further our exploration of other planets, as this mission went smoothly and a Minmus landing was relatively easy to plan and execute. We need to do research on whichever planets we focus on next, as it was our research on Minmus that let us know it had very mountainous terrain and as a result we were able to focus on landing on a level area. Congratulations on your successful mission and your award! Great job! A first landing feels great, Doesn't it? And what an impressive water bottle rocket it was! You can watch the video highlights below. Thanks to Brendan for putting this together!